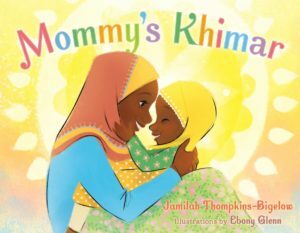 Mommy’s Khimar is a fanciful book about a young Muslim Black girl who plays dress up with her mother’s khimars (Islamic headscarves). Her favorite khimar is a yellow one and when she wears it, she lets her imagination run wild and transforms herself into a superhero and the sun. Equally important, the yellow khimar connects her with her religious community, her interfaith family, and ultimately her mother. It’s a very cute story with incredible illustrations and color. The attention to detail in the khimars is meticulous and vibrant. You can feel the love Jamilah has for her heritage and her children in every word. The Philadelphia author has been busy on a book tour, but took a little time to chat with us about her book, writing, her writing pet peeve, motherhood and balance (or the lack of balance). I’ve always liked to write as a hobby; however, in terms of trying to write professionally, I’ve been writing children’s literature for three years. What is your favorite book to read for inspiration? It’s hard to pick out just one book I read for inspiration. Whenever I read a good children’s book, I feel inspired to write books too and I read a lot of children’s books. Right now, I enjoy reading books by Jacqueline Woodson, Matt de la Pena, and Hena Khan. I’ve also gotten into some YA authors like S. K. Ali, Angie Thomas, and Nicola Yoon. What made you want to write “Mommy’s Khimar”? I wrote this book because I wanted to tell a unique story about the Muslim headscarf, also called a hijab or khimar. I wanted to story to be different from any I had seen before. I also wanted to tell a story that starred a Black American Muslim girl. To some extent, I wrote this book just for Black American Muslims like me. I knew I wanted to publish this book for a mainstream audience. However, to keep the book authentic, I had to remind myself to center the gaze of Black American Muslims. I simply wanted our kids to have a book because there are so few about them. However, because the book is published by a traditional publisher, I also knew my audience would be broader. My audience is also people who don’t know a lot about my specific group but are open to learning. Coming from a teaching background, I was especially concerned about educators. I thought about them a lot as I was crafting the text. How long did it take you to write Mommy’s Khimar? From conception of the idea through all the revision stages, it took about five months. As a mom and working professional, I write during my spare time and it takes long. What was the publishing process like? Were there challenges? I would say the publishing process wasn’t typical. I didn’t have an agent when I submitted the book but Salaam Reads, an imprint of Simon & Schuster, was accepting un-agented work and I pitched this book to them only. In about five weeks, I had a response with a request for revision. I submitted a revision in about a week’s time, and that night, I received an enthusiastic email from the editor. A few weeks later I received an offer on the book. The biggest challenge was finding out that it would take two years to publish. During the two years, it was nice seeing the book take shape through the illustrations of Ebony Glenn, but I had to be very patient. How has the initial reception been? What are your plans for the book as far as promotion? I’m doing several events locally now that Mommy’s Khimar has just launched, and I look forward to doing events throughout the U.S. soon. I’m also open to doing online events. We’re trying to especially promote the book around holidays like Mother’s Day and Ramadan. We’re especially targeting education and library groups as well as Muslim communities. Is there a good niche for books aimed at Muslim youths? I believe so. 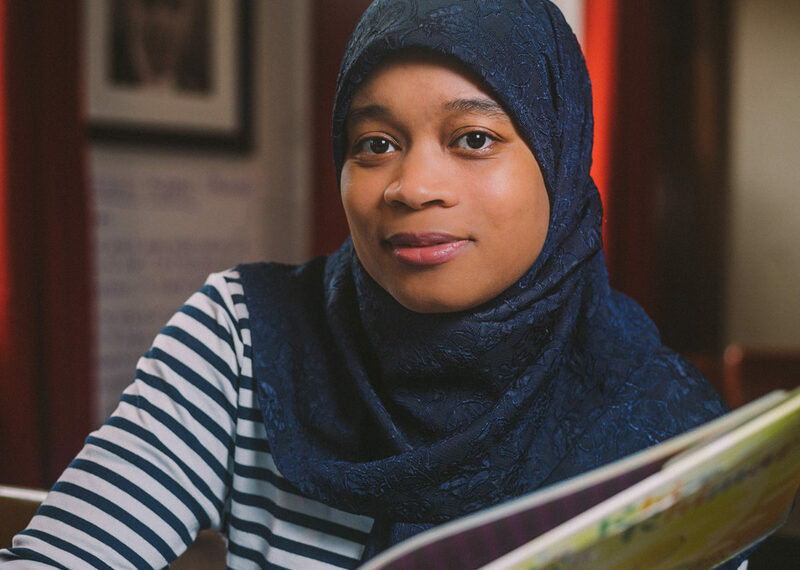 I am especially encouraged by a major children’s book publisher like Simon & Schuster opening an imprint like Salaam Reads, which centers Muslim youth. It tells me they believe there’s a niche too but also that these books can transcend the niche market and be appreciated by wider audiences. I don’t really believe that’s a thing. It’s true that a person can run out of ideas but for me, this just means sitting down in front of a computer or pad of paper and freewriting and brainstorming—writing myself out of writer’s block. I can’t wait to be inspired. I have to write, or I’ll never get anything done. What is your writing pet peeve? I hate it when people write one overly long sentence after another. I like variety in sentence structure and I admire people who can pack a lot of meaning into just a few words. It’s something I’m working on myself! How did you get involved with Mighty Writers? I was getting burnt out as a classroom teacher although I still wanted to educate youth. I saw Mighty Writers as a way to try something new. I was on my school’s spring break when I noticed Mighty Writers had an opening. I took a leap and now I’m there. What’s your favorite memory of your children? It’s hard to pin down a single favorite memory for my two boys. There are many moments I love. I think the ones that best show their personalities are the ones I love best. For example, my oldest child used to have to stop every few feet whenever we were walking to stop and observe the little things around him. He’s the kind of person who has to stop and smell the roses. He looked at everything with wonder and would point it out to others. It used to annoy me sometimes when we were in a rush but now I miss it. My youngest walked across a room when he was 10 months old. He hadn’t practiced taking steps before. Out of nowhere, he just started walking. He also started jumping off of the couch as a toddler. He would climb up to the very top and leap. He’s always been fearless. Is there something of your Mother’s that reminds you of her? I don’t have any specific object. Nursery rhymes remind me of her. She was always singing them, not just to us, but to herself as well. How does being a mom affect your writing? My time is very limited, so I have to focus on writing about the topics and in the genres I’m most passionate about. Often, my kids also serve as inspiration in my stories. My oldest son—in the way he is so artistic and loves color—was definitely someone who inspired the main character in Mommy’s Khimar even though that character is a girl. I also write books that I think my kids might want to read. They are definitely my first beta readers for many of my manuscripts. Do you ever wonder how your children view you? I guess I do to some extent. I think about how they might view me in the future when they are adults. I want them to see me as a source of support and love. I hope they’re inspired by me and will try to do difficult things. As adults, I hope we can be friends and even work together. My oldest child has already told me he wants to illustrate my books some day. I hope this happens! As a woman, a mother, writer, a Muslim, and more how do you balance all the sides of yourself? I don’t. I do try, but the truth is my life is out of balance all the time. I just accept that I can’t be perfect. I try to stay grounded in the things I care about the most—my faith and my family. But sometimes I do need reminders when my life is getting too imbalanced. I think having good people in your life who remind you of what’s important is key.